This dock is relatively small and is compatible with many current and older desktops, laptops and tablets. The device's design does not suggest it was a focus for the manufacturer, and the quality of the components with which the dock is built allow for physical imperfections. 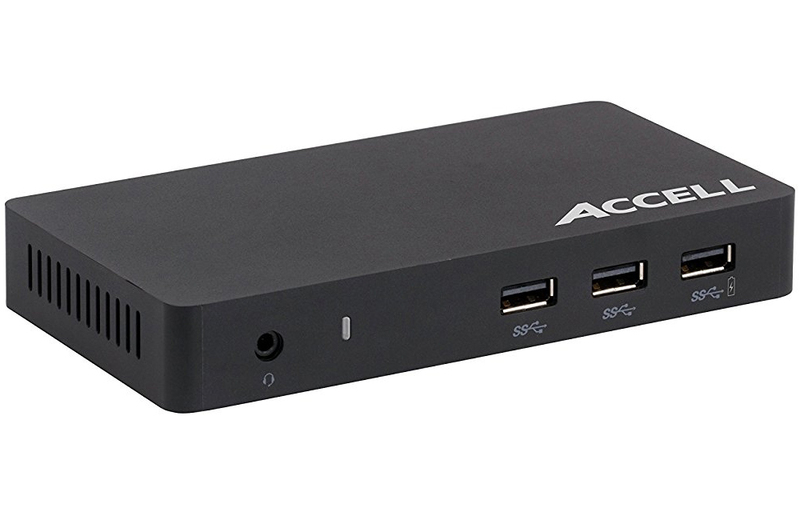 If you are looking for a way to improve the convenience of using your laptop or tablet as a desktop workstation, this docking station from Accell is definitely worth consideration. While the Design and Build Quality leave something to be desired, neither of those aspects are nearly as important as the Functionality of the device itself. Fortunately, the device works better than is to be expected, especially for the price. While other docks like this run 25% more expensive for the same functionality, this one certainly sets itself apart on price and overall Size & Weight. The design is definitely utilitarian. The product is essentially a small black box with ports on it. Nothing about the design is going to make the owner want to show it off, but that is not the point of the product. In fact, the point of the product is to move the product away from the eye, so utilitarian matches the product's intention. Some thought really went into the placement of the ports on the device. On the back are your permanent connections: power, dock, HDMI, DisplayPort and Ethernet. On the front are your more transient connections: USB and headphone. Unfortunately, if you were to place this device under a monitor, so you can use the transient connections, it would force you to have cables or dongles for keyboard and mouse, which are designed to be permanent connections on this dock, stick out of the front. Ideally, I would have liked to see maybe the HDMI and DisplayPort connections stacked and a USB port made available on the back. Straight out of the box, the look of the product is positive. The body looks well-formed, the cables are thick and flexible. Unfortunately, once the product came out of the box, perception began to change. The body of the box was a little damaged around the edges, showing the quality of the plastic body itself to be less than desirable. Fortunately, this is not a product that is designed to be featured on a desk, but more to be hidden away, so a little damage to the plastic isn't a killer. The build issue that does cause some concern is the ports themselves. While many USB ports are tight and hold the plugs in place, these ports are all very loose. The included USB cable, plugged either into the docking port or into any of the standard USB ports, moved around in place. Other USB devices, including a microSD card reader and several USB flash drives, all moved around as well. The HDMI port suffered the same issue. We tested the functionality of the dock using a Microsoft Surface Pro running Windows 10 Anniversary Update. This tablet features a 3rd generation Intel Core i5 processor and 4GB of RAM, with a single USB 3.0 port. Because of the single port, the Surface is a perfect product with which to use the dock. We tested USB speed by copying one large and many small files from the internal storage of the Surface to a USB 2.0 and 3.0 flash drive. Both the 2.0 and 3.0 flash drive copied files at the same speed plugged directly into the tablet's USB port and into the USB hub built-in to the dock. The speed was not hampered by using the integrated video card, either. As most USB video cards are, the integrated card here is powered by DisplayLink technology. Over the years I have used several DisplayLink-powered cards to great success, including on this particular tablet. Because this card is USB-powered, it means that it will use resources built into the computer to power its capabilities. Running no applications, the tablet sits at 4% CPU usage when running an external monitor on its integrated video card. The usage jumps up to 14% when running the second monitor through the dock. Watching a video through Hulu on the secondary monitor, powered by the integrated video card, CPU usage averaged 40%. When running the same video on the same monitor, powered by the DisplayLink video card, CPU usage spiked to an average of 70%. Surprisingly, RAM was not affected between the video cards. As USB-powered Ethernet cards are not a new concept, the Ethernet connection worked at the full, expected speed. Since this product is not designed to be portable, its weight is far less important than its size, though its weight is definitely acceptable for its purpose. The size, however, is where this product really shines. The height of the body is the perfect size to fit under a monitor, exposing the transient connections and hiding the permanent connections. On all of our desks, in the office and studio, the box slipped nicely under our monitors and televisions. Obviously the docking station requires that the laptop or tablet have a USB 3.0 port: the support of UDH, or 4K, video definitely requires the bandwidth. The video card requirements are pretty standard for most laptops, as are the processor requirements. A minimum RAM requirement of 4GB is also pretty standard, though using it with a machine that only has 4GB of RAM is likely to affect the performance of the computer fairly heavily. That performance difference is detailed in Functionality.